The Swallow Man is not Anna's father—she knows that very well—but she also knows that, like her father, he's in danger of being taken, and like her father, he has a gift for languages: Polish, Russian, German, Yiddish, even Bird. When he summons a bright, beautiful swallow down to his hand to stop her from crying, Anna is entranced. She follows him into the wilderness. From the cover What Do You Say? Anna did not know that the chief of the Gestapo in occupied Poland had by fiat compelled the rector of the Jagiellonian University to require the attendance of all professors (of whom her father was one) at a lecture and discussion on the direction of the Polish Academy under German sovereignty, to take place at noon on that day. She did not know that, in the company of his colleagues, her father would be taken from lecture hall number 56, first to a prison in Krakow, where they lived, and subsequently to a number of other internment facilities across Poland, before finally being transported to the Sachsenhausen concentration camp in Germany. She also did not know that, several months later, a group of her father's surviving colleagues would be moved to the far more infamous Dachau camp in Upper Bavaria, but that, by the time of that transfer, her father would no longer exist in a state in which he was capable of being moved. What Anna did know that morning was that her father had to go away for a few hours. Seven-year-old girls are a hugely varied bunch. Some of them will tell you that they've long since grown up, and you'd have trouble not agreeing with them; others seem to care much more about the hidden childhood secrets chalked on the insides of their heads than they do about telling a grown-up anything at all; and still others (this being the largest group by far) have not yet entirely decided to which camp they belong, and depending on the day, the hour, even the moment, they may show you completely different faces from the ones you thought you might find. Anna was one of these last girls at age seven, and her father helped to foster the ambivalent condition. He treated her like an adult—with respect, deference, and consideration—but somehow, simultaneously, he managed to protect and preserve in her the feeling that everything she encountered in the world was a brand-new discovery, unique to her own mind. Anna's father was a professor of linguistics at the Jagiellonian University in Krakow, and living with him meant that every day of the week was in a different language. By the time Anna had reached the age of seven, her German, Russian, French, and English were all good, and she had a fair amount of Yiddish and Ukrainian and a little Armenian and Carpathian Romany as well. One does not learn as many languages as Anna's father had without a fair bit of love for talking. Most of her memories of her father were of him speaking—laughing and joking, arguing and sighing—with one of the many friends and conversation partners he cultivated around the city. In fact, for much of her life with him, Anna had thought that each of the languages her father spoke had been tailored, like a bespoke suit of clothes, to the individual person with whom he conversed. French was not French; it was Monsieur Bouchard. Yiddish was not Yiddish; it was Reb Shmulik. Every word and phrase of Armenian that Anna had ever heard reminded her of the face of the little old tatik who always greeted her and her father with small cups of strong, bitter coffee. Anna is seven years old when the Nazis come for her linguistics professor father. In 1939 Poland, many children are left orphaned or are taken to concentration camps, but Anna finds refuge of a sort by traveling with a tall, thin man, who communicates with birds and speaks in metaphors. 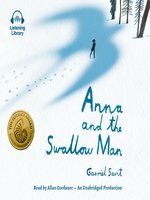 Anna and the Swallow Man speak in Polish, German, Russian, Yiddish, and French. Reader Corduner performs these lines with the lightest of accents, flavoring the story and never overwhelming the listener. Corduner’s gentle tone of voice makes young Anna come alive without resorting to high-pitched breathiness. His Swallow Man is mysterious but also comforting, setting up great tension in the story. 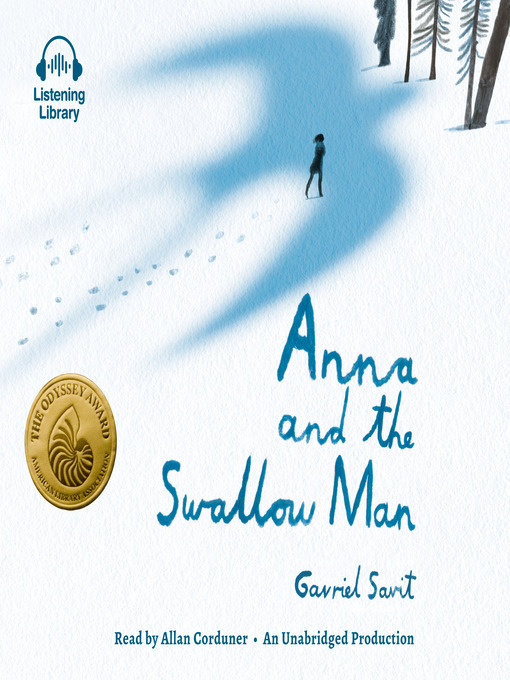 In his quiet yet firm manner, the Swallow Man teaches Anna lessons of survival, some of which challenge her instincts to be honest and compassionate. Corduner handles the story deftly, simply letting Savit’s words do the work and never hamming it up in his performance. This book is more than simple historical fiction; it is almost a fable about how to live in hard times. Corduner’s performance is also more than simple narration—it is remarkable. Ages 12–up. A Knopf hardcover. Like Life Is Beautiful and The Boy in the Striped Pajamas, this deeply moving debut novel, set in Poland and Germany during WWII, casts naïveté against the cruel backdrop of inhumanity. Late one autumn morning, seven-year-old Anna is put under the care of a pharmacist. Her father is supposed to retrieve her in a few hours, but he never returns. Cast from her caretaker’s shop, Anna has nowhere to turn until she falls in with a reluctant stranger, a tall, reticent man. Thus begins a years-long journey through the woods and beyond that draws Anna closer and closer to the strange man, who communicates with birds and speaks in metaphors (“Everything he said—even, perhaps especially, the things he left out—seemed to carry the reliable weight of truth”). In his quiet yet firm manner, the Swallow Man teaches Anna lessons of survival, some of which challenge her instincts to be honest and compassionate. Savit’s economical prose beautifully captures a child’s loss of innocence and the spiritual challenges that emerge when a safe world suddenly becomes threatening. The subject matter and gritty imagery may be too intense for some younger readers, but those knowledgeable of wartime atrocities will recognize the profundity of the bond of trust built between two strangers who become increasingly dependent on each other. Ages 12–up. Agent: Catherine Drayton, Inkwell Management.